the pink toque. a craft blog: To Circular Knit or Not to Circular Knit? To Circular Knit or Not to Circular Knit? In my last update I was excited that I was about 25% into a blanket for Lucas' mom for Christmas, and currently I'm 37%. I've never knitted a blanket before* and since Lucas' mom was the one that taught me how to knit, I have been determined to knit her a blanket for Christmas as a way of thanking her and showing her what she had taught me put to use. 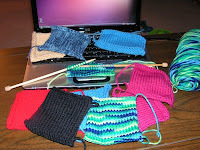 Not really knowing much meant I somewhat went blindly into the project, and I found from reading various websites out there that a typical way to knit blankets is to knit a series of squares (sometimes referred to as "granny squares") and then knit/stitch them together in a way that is somewhat seamless. This seemed like a fairly standard method and something I could handle, so I grabbed skeins of yarn that I had** of the same worsted weight and had planned to just make a bunch of random coloured squares to stitch together to make the blanket. But then I learned about the magic of circular needles. The potential of circular needles is astronomical, at least it seems that way to me now as a somewhat newbie knitter. It never really occured to me that I could knit flat pieces on circular needles, or that circular needles would allow me to knit larger, wider flat pieces than I would be able to accomplish with two regular needles. To me, circular needles were for projects where you needed to knit solely in the round and regular needles were for making flat pieces. Realizing otherwise was like a newfound discovery, and suddenly my whole way of thinking about knitting changed. Using circular needles on the blanket project would cut out the middle men of blocking each individual square AND having to stitch them all together, both being things that intimidate me a little bit. I think that alone would save me an incredible amount of time and stress in the end, though eventually I will need to learn and master both of those techniques. Baby steps! So now I'm torn. Do I stop now and start over with a pair of circular needles? Do I have time? I currently have 15 knitted squares complete out of a grand total of 40 that I had originally planned on doing, so not quite halfway yet and less than two months to Christmas. I was thinking that I could put the 15 finished squares to good use instead of giving up on them completely -- I mean, a part of my heart and soul went into those already, and I'd hate to use them just as random dish cloths in the kitchen. My next thought was to go with a pillow idea like I had once toyed with, and maybe make a knitted pillow for my mom out of the squares. That way both Lucas' mom and my mom would have something knitted from me for Christmas. Helping me to discover the potential of using circular needles on a more regular basis is Theresa Vinson Stenersen of Knitty.com. Her circular needle technique article blew me away! Not only do I have a good gauge of what size/length of needles I'd need for various projects, but the step by step photographs are incredibly clear, up close, and easy to see. Her intro and explanations are very well written with lots of details and already make me feel comfortable giving this technique a try even before I've had a chance to pick up a set of circular needles. I then discovered the Knitty Coffeeshop message board where, alongside of craftster forum, I will be spending a fair amount of time! I've also read now in more than one place that using circular needles over time instead of flat needles (now that I know I can use circular needles for both!) is easier on your body because the needles more evenly distributes the bulk of the weight of your project instead of your wrists, which I found interesting. All of the signs seem to be pointing me to try out circular needles. What do you think? If you're a regular knitter or someone who is experienced with knitting on both regular and circular needles, what do you recommend? Do you think it's worth my time and effort with less than 2 months to go to stop at square 15 of 40 and start the blanket over again on circular needles instead? At any rate, I think I will sweet talk Lucas to make a trip over to Michael's this evening after work, just to satisfy my curiosity and excitement about learning something new in the realm of knitting to improve myself and my techniques. I'll update later with my decision and post my status with the project after I give circular needles a try. Wish me luck! * I used a Knifty Knitter flat loom to loom knit a blanket for Lucas a few Valentine's Days ago, but I didn't know anything about traditional knitting with needles back then and had no idea what I was doing when I joined the loomed squares together, thus the result looked nice but couldn't withstand the test of time or everyday use. ** Lucas and I went garage sale'ing a few months ago and came across a steal: someone was selling an entire box of various skeins of yarn in all different colours and weights for $5. So I've got this huge box of both new and leftover skeins of yarn in the basement to pick through. Hey thanks for this article! I didn't know about knitting flat pieces of circulars either until now.